Quirky, the New York based startup company, is turning technological theories into actual products, Ben Kaufman, the founder of Quirky, has helped bring tech products to the masses. Now, Quirky is setting their sites on the smart home security industry. 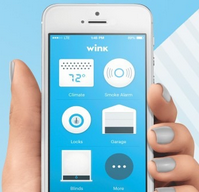 Their product, Wink, is making a splash in the mobile home security space. With a “Wink” consumers could control their lights, refrigerators, thermostats etc. With the main component of the Wink system, the hub, the system can interpret different connection languages and work in unison. This means you can buy your thermostat from one company, your refrigerator from another, and your lights from someone else, yet they can all e connected. The Wink systems will be able to bring all home functions together and work from one app. On July 7, Wink will announce its first 15 partnerships, which will bring 60 products under one network. The Wink hub will be coming to 2,000 Home Depots in July and Amazon.com in the very near future.